Since 2003, Secret Compass has been a respected source of limited edition collectibles, movie merchandise, art, and pretty much anything else sci-fi, steampunk, fantasy, or geek-chic. They pride themselves on quality and dependability, always going the extra mile to meet the needs of their wide range of customers. Shane Cooper, the CEO of the company, has been an avid collector of limited edition movie merchandise and collectibles for over 15 years. Back in 2003 he realized he could buy multiples of the things he was collecting and sell the extras, as a way to pay for his collection and share his passion. A business model was born, and Secret Compass been steadily growing ever since. What started in a garage is now in a 3000 square foot warehouse, complete with a showroom in Fort Collins. 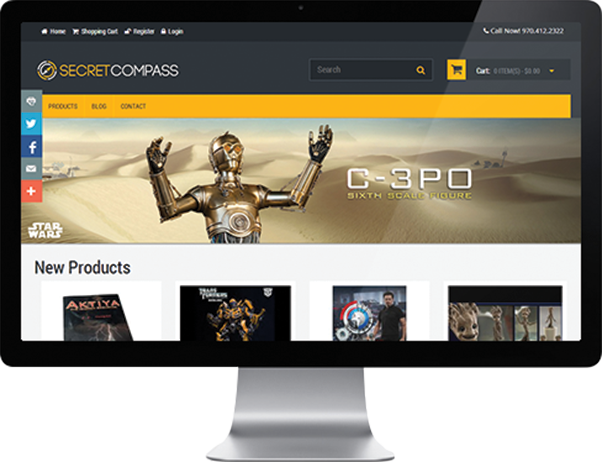 AllProWebTools is proud to be a part of Secret Compass’ success. We love partnering up with local small businesses, and we’ve learned a lot from meeting Secret Compass’ unique business needs. But, of course, with that autonomy and variety comes some unique challenges. As a startup ourselves, AllProWebTools understands the value of efficiency, and we are committed to helping all our users find places to save time and money, without ever sacrificing quality. With the help of AllProWebTools, Secret Compass has streamlined their ordering and shipping processes and increased employee productivity. AllProWebTools has been building a custom front and back end for Secret Compass’ business management. They switched to our service from an expensive platform that was too large and complex, to a system designed specifically for companies of their size. In keeping with lean thinking, we offer them a solution that is no bulkier than what they really need, but with room to scale up. This is the model we offer to all our users, to help small business owners make the most efficient use of their limited resources. AllProWebTools is proud to work with a number of small businesses along the Front Range and all over the United States. We love to support local small businesses and continue to build, manage and grow our locally-owned community. If you or someone you know could benefit from AllProWebTools business management software, we'd love to hear from you! For more information on Secret Compass, visit secretcompassonline.com or call (970) 412-2322.